Having got engaged whilst on holiday in sunny Snowdonia in June 2010, our next holiday was to somewhere considerably less clement - icy, snowy Skegness in early December. 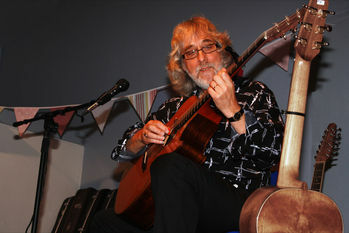 Despite an 8 hour journey from rural Somerset to deepest Skeggy to experience the inaugural 'Great British Folk Festival' the highlight of our weekend was the Sunday afternoon session from Gordon Giltrap. 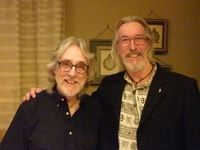 Within days of returning home we eagerly contacted Gordon's agent Sue Holton to see if the man himself was available and able to 'do his thing' at our Wedding reception on 1 October 2011 - he was and he could! The winter, spring and summer months passed; the 101 other 'Wedding things' were planned, booked and sorted; Gordon's accommodation was arranged and letters exchanged about what he could expect on his arrival at our nearby Village Hall to set up and sound check and the evening of his concert session itself. The week prior to our Wedding was blessed with wonderful weather, as was the day itself. As we were busy getting dressed, getting to the church and getting married at 2pm we could only assume that Gordon and Hilary had found their way to their B&B successfully and the mile or so to Camerton Village Hall. As our Wedding photographs were being taken after the ceremony our photographer was able to confirm that they had arrived and that Gordon was happy for photographs of him setting up and sound checking to be taken - he even showed us a few of the shots he had taken of a smiling Gordon whilst our family members were getting into and out of position for their photographs! Our Wedding reception was 'Traditional Afternoon Tea' so Gordon and Hilary had an early afternoon tea served by Yvonne and her team on the vintage china we had hired from 'Vintage Vicki'. As we and our 100 guests arrived at our Reception and grabbed a much needed Pimms we could see Gordon's guitars set up on the stage ready for a few hours time. Fully aware that these were the 'tools of the trade' of the man we had referred to on our Wedding invitations as 'the acclaimed guitarist Mr Gordon Giltrap' the valuable (priceless!) equipment was shown appropriate respect and no one went near the stage all afternoon. We were delighted when Gordon and Hilary joined us around 7pm and happily chatted with our guests, which included a number of amateur (very in some cases!) guitar players. At 8.15 we had the pleasure of welcoming Gordon to the stage of the newly named 'Camerton Palais' - the next 75 minutes were filled with sublime music, very amusing anecdotes (some old, some new) and audience interaction. In honour of our Wedding Day and the glorious sunshine Gordon told our audience that he had composed a new song that very afternoon - a collective "aah" turned into a small groan as the recognisable notes of 'Here comes the sun' filled the hall! 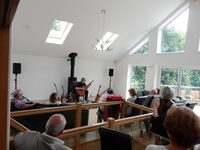 As Gordon's session progressed it was clear to see that our guests, who ranged in age from 16 to 89, and who's musical tastes ranged from Chas and Dave to Van der Graaf Generator were thoroughly enjoying being entertained by Gordon. 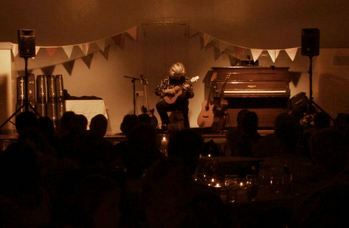 'Dodo's Dream' filled the Camerton evening with subtle and searing guitar sounds, 'Heartsong' transported people back to their 'Holiday' programme watching days and 'Lucifer's Cage' (which for some strange reason in a letter to Gordon we called 'Lucifer's Friend' - must have been the Wedding nerves!) was performed with typically great energy. As Gordon finished each song and drew his wonderful set to a rousing conclusion the audience response was everything we anticipated and knew it would be - loud, sincere and appreciative of a special and unique experience shared and enjoyed by us all. We loved the fact that Gordon and Hilary stayed with us to enjoy supper and continue to talk with our guests - one of whom shared with him that she grew up in the road next to where he used to live in Deptford - it's definitely a very small world! Thank you so much Gordon and Hilary for coming down to West Country to add the icing on the cake to our wonderful Wedding Day. All of our contacts with Sue Holton were as they were with yourselves - very friendly and professional. Also many thanks for agreeing to photographs being taken during your performance - the few accompanying this piece were taken by Hannah Davis, our young friend who we asked to be 'official Gordon Giltrap photographer' for the evening.